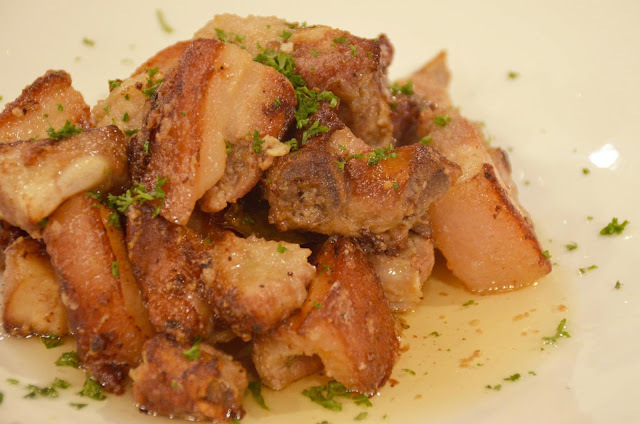 Adobo Pampango de Logro is the first dish that Chef Boy lays out. The unmistakable odors and flavors of this native Kapampangan dish inevitably bring back memories of special milestones in the life not just for Victor but of all Filipinos who swear Adobo as their national food. 1. Marinate and mix all ingredients overnight. Place it on large pot then boil for 10 minutes and simmer for 1 hour or until tender. 2. Remove oil from adobo fat, and fry skin of adobo belly chunks into adobo oil until golden brown. 3.Toss again into remaining sauce and serve immediately.